Mihai Parparita, who is now a Chrome engineer, wrote a Chrome extension that lets you find apps from the Chrome Web Store without visiting the store. The extension simply adds a plus icon to the address bar when you visit a site that has a corresponding app in the Chrome Web Store. "Discovery (i.e., how a user finds apps to install) is an interesting aspect of app stores. In some ways, discovery is not necessary: a significant appeal of the store is that it catalogs all the apps, so if the user is looking for a todo list or Twitter client, it's pretty obvious what to search for. However, that assumes that the user has a specific need in mind already, and is aware that that class of application exists," explains Mihai. For now, Mihai's extension is just an experiment. The list of supported apps is included in a text file, which is incomplete and has to be updated. One of the advantages of using a static list is that the extension doesn't send your browsing history to a server. Another advantage is that it's much easier to find matches for the sites you've already visited. After installing the extension, a page titled "there's a Web app for that" will suggest some apps for the sites you're visiting frequently. 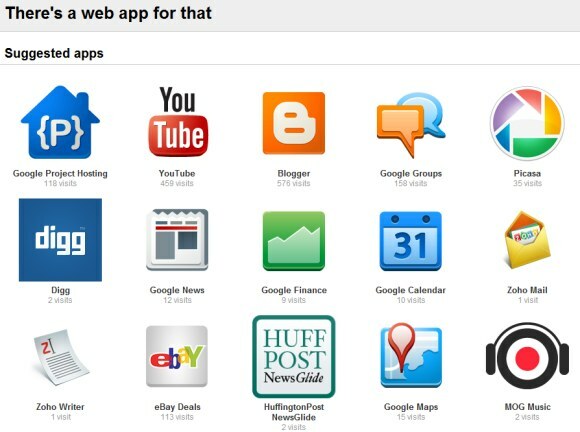 It's important to mention that the Chrome Web Store only lists official hosted apps. "If your hosted app is listed in the Chrome Web Store, you must prove that you control each domain specified in [the app field]," informs Google. There's a workaround for this, as the unofficial Google Music app shows: linking to a local HTML file that redirects to the app's URL. The Google Music app is a packaged app, not a hosted app, so Mihai's extension doesn't include it. Right now, most of the apps are just shortcuts and the main benefit is that they're easily accessible from the new tab page. Some apps offer additional features and a small number of apps are actually full-fledged extensions (packaged apps). Google doesn't categorize apps and doesn't inform users if an app works offline. As a follow-up question (which is, admittedly, off-topic), when does everyone think we'll be able to tag Google+ users in Blogger coments, using @ or +? Should be a default extension in Chrome. Seems like a good app but doesn't work here. b) my apps don't appear on the web page that the app generates. It is very easy to using and flexible to every one,thanks a lot of this chrome blog.